James Serrin is known to his friends and colleagues as Jim. His parents were James Burton Serrin and Helen Elizabeth Wingate. Although James was born in Chicago, he was brought up in Evanston, Illinois. It was in Evanston that James's brother Richard Wingate Serrin was born in 1928. Both boys attended Evanston Township High School with James graduating in 1944 and his brother Richard two years later. Both boys loved music and art and Richard was on his way to becoming an established artist by the time he graduated from the High School. For James, however, music and art were hobbies as he entered Northwestern University in 1944 to study science and engineering. He majored in Electrical Engineering at Northwestern University before going on to Western Michigan College, Kalamazoo in 1946 (it did not become Western Michigan University until 1957). He received a Bachelor of Arts degree from Western Michigan College in 1947. In the years 1948 to 1950, James Serrin had the unique opportunity of attending lecture courses on elliptic differential equations given by Professors Eberhard Hopf and David Gilbarg at Indiana University. These exemplary lectures first awakened his interest in this theory and in particular of the maximum principle. The authors discuss the theory of a finite cavity containing a backward jet behind a body in two dimensional irrotational incompressible flow. The backward jet is a mathematical fiction whose departure from the physical facts does not appear to seriously effect the field of flow not in its immediate vicinity, according to experimental evidence now available. One of the usual conformal mapping techniques effective in solving problems involving straight boundaries is used to treat the problems of flow about an inclined plate and a wedge, in which, however, emphasis is placed on a generalization of the Schwarz transformation in which branch points are arbitrarily placed in the interior of the polygon which as a result occupies a Riemann surface. A set of conditions is given for the solution of flow problems involving curved boundaries. Serrin was awarded a Ph.D. in 1951 for his thesis The Existence and Uniqueness of Flows Solving Four Free Boundary Problems. 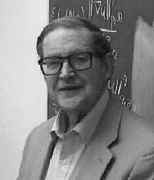 He published this work under the title Existence theorems for some hydrodynamical free boundary problems in the first issue of the Journal of Rational Mechanics and Analysis in 1952. This journal was later renamed the Archives for Rational Mechanics and Analysis and Serrin joined the editorial board in 1963. After the award of his doctorate, he was appointed as Fine Instructor of Mathematics at Princeton University. From Princeton he moved to the Massachusetts Institute of Technology where he was a C L E Moore Instructor of Mathematics during 1952-54. It was on 6 September 1952 that he married Barbara West; they had three daughters, Martha (born 1953), Elizabeth (born 1957) and Janet (born 1963). In addition to his work on hydrodynamics, he also began publishing very significant results on elliptic differential equations with papers such as On the Phragmen-Lindelöf theorem for elliptic partial differential equations (1954), On the Harnack inequality for linear elliptic equations (1956) and (with David Gilbarg) On isolated singularities of solutions of second order linear elliptic equations (1956). One of the fundamental questions which should be answered concerning any problem of applied mathematics is whether it is well set, that is, whether solutions actually exist and whether they are unique. We shall be concerned here with the initial value problem for compressible fluid flow, and we shall study in particular the uniqueness of its solutions. For the first time he defined the value of the functional by using some ideas from the theory of surfaces, a set of ideas which will come back triumphantly a few years later. The period 1963-1964 highlights the full maturity of Jim Serrin's thought, in particular in mastering the art of well adapted test functions for studying general quasilinear equations. It is during that period that his two articles ['Local behavior of solutions of quasi-linear equations' (1964) and 'Isolated singularities of solutions of quasi-linear equations' (1965)] on isolated singularities were published in 'Acta Mathematica'. Shortly afterwards, in collaboration with Howard Jenkins, James Serrin published a surprising article on construction of minimal surfaces. And this was the first evidence of his growing interest in differential geometry. ... The climax of this work is his famous article 'The problem of Dirichlet for quasilinear differentials equations with many independent variables', published in London in 1969 in the 'Philosophical Transactions of the Royal Society'. ... for his fundamental contributions to the theory of nonlinear partial differential equations, especially his work on existence and regularity theory for nonlinear elliptic equations, and applications of his work to the theory of minimal surfaces in higher dimensions. He served on the Council of the American Mathematical Society during 1972-74. In 1979 he received the Distinguished Alumni Award from Indiana University and, in the following year, was elected a fellow of the American Association for the Advancement of Science and a member of the National Academy of Sciences. In 1984 he was elected a member of the American Academy of Arts and Sciences and, in 1992, received honorary doctorates from the University of Ferrara and the University of Padova. In 1995 Serrin retired and was named Professor Emeritus of Mathematics by the University of Minnesota. In the same year he was elected to the Finnish Academy of Sciences. Mathematical analysis, calculus of variations and geometry were not sufficient for James Serrin. Hence, after some brilliant first contributions to hydrodynamics, he turned his research towards other problems arising from physics, such as boundary layers phenomenon, tornadoes, phase transitions and finally on thermodynamics. [He] is now widely considered as the Bourbaki of thermodynamics. ... as an introduction to the axiomatic formulation of thermodynamics these notes are definitely stimulating. The maximum principle enables us to obtain information about solutions of differential equations and inequalities without any explicit knowledge of the solutions themselves, and thus can be a valuable tool in scientific research. In particular, this book should prove useful not only to professional mathematicians and students primarily interested in mathematics, but also to physicists, chemists, engineers and economists. The maximum principle moreover occurs in so many places and in such varied forms that anyone learning about it becomes acquainted with the classically important partial differential equations and, at the same time, discovers the reason for their importance. Since its first applications in the study of the Laplace and linear elliptic operators in general, the maximum principle has found a wide range of applications in nonlinear partial differential equations and inequalities, including equations involving the celebrated p-Laplace operator. A wealth of instances of such applications can be found in this book, clearly presented and thoroughly discussed. Complete or almost complete proofs are given to most results, and the presentation is usually very clear. Many results and even some of the proofs of standard results are new. Furthermore, the reader will find the first presentations in book form of the compact support principle and the general theory of structured elliptic inequalities. Notable features of this book include the careful historical research and the presence of interesting problems of varying difficulty at the end of each chapter, a rarity in books at this level. We noted above the two addresses that Serrin gave to the International Congress. He has given many other invited addresses at numerous international conferences held in the United States, England, Scotland, Italy, Canada, Israel, Poland, Hungary, India, France and Spain. He has addressed meetings of the American Mathematical Society, the Swedish Mathematical Society, the Finnish Mathematical Society, the Italian Mathematical Union, the Circolo Mathematico di Palermo, and the Canadian Mathematical Society. He has served on the editorial boards of many major journals including the Archive for Rational Mechanics and Analysis, the Journal of Differential Equations, Communications in Partial Differential Equations, the Bulletin of the American Mathematical Society, Rendiconti Circolo Matematico di Palermo, Asymptotic Analysis, Differential and Integral Equations, Communications in Applied Analysis, and Advances in Differential Equations. ... his interest in classical music and his sophisticated and ample collection of rare records; his sincere love of art and architecture and his splendid paintings (many by Professor Serrin's brother Richard), and his selection of fine objects collected with Barbara year by year, his warm and large library with impressive and almost unique books on art; and the collection of photographs taken essentially during his scientific travels. What exquisite hosts Barbara and Jim Serrin are! In their house, with antiques and memories, paintings and books, I had the privilege to have lunch on beautiful Wedgwood china, before attending a concert in their company.